Trinity PR works with a growing number of clients providing healthcare services into the NHS including out-of-hospital care and hi-tech medical equipment and systems. For example, we run the corporate PR and campaigns programme for Omnicell – a leading provider of medication and supply management solutions including automated medication dispensing cabinets to the global healthcare market. 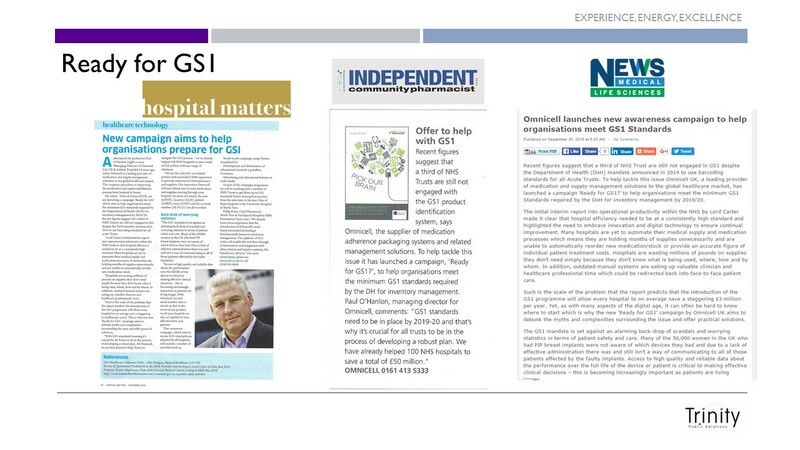 We recently launched a digital and trade media campaign ‘Ready for GS1’ which aimed to help hospitals to meet the minimum GS1 standards required by the Department of Health for inventory management by 2019/20. Trinity PR created and implemented the news campaign including infographics, a series of advertorial placements as well as editorial coverage in leading trade titles to help reach key influencers. We also work alongside Totally Health Ltd – a specialist provider of Clinical Health Coaching services delivered via the NHS. We regularly develop media case studies to demonstrate the impact of the service including reduction in unplanned admissions to A&E following successful evaluations of projects with NHS partners such as Hartlepool and Stockton CCG and Leicester City CCG. The team at Trinity has a strong heritage of supporting emerging health care technologies and working with organisations to raise brand profile and product awareness via media campaigns. Trinity has worked as the Harley Street Fertility Clinic’s (HSFC) retained PR agency since 2012 with the aim of raising the organisation’s profile amongst consumers and healthcare professionals alike to help increase patient referrals.